Calculates location-aware Muslim prayer times. It also provides alarm/reminder notifications with Azhan sound as well as live tile updates on prayer times. *(In Mango) Qibla direction is calculated based on your location. If your device has a compass sensor, then the compass will reflect the reading from the sensor making it easier to find Qibla direction. 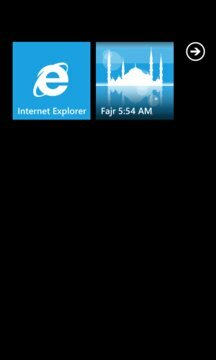 When Live Tile feature is enabled, the live tile shows the next prayer time. The back face of the tile shows all prayer times for the day. Live tile info is updated once every 30 minutes. To make sure you continue to receive Prayer alarms and tile updates, please open the application at least once every 14 days. If you happen to forget, you will receive toast notification before expiry to remind you to open the app.